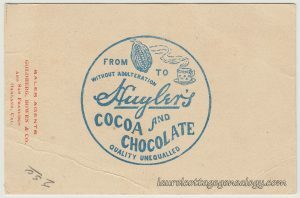 Trade card for Huyler’s Cocoa and Chocolate. Circa 1903. 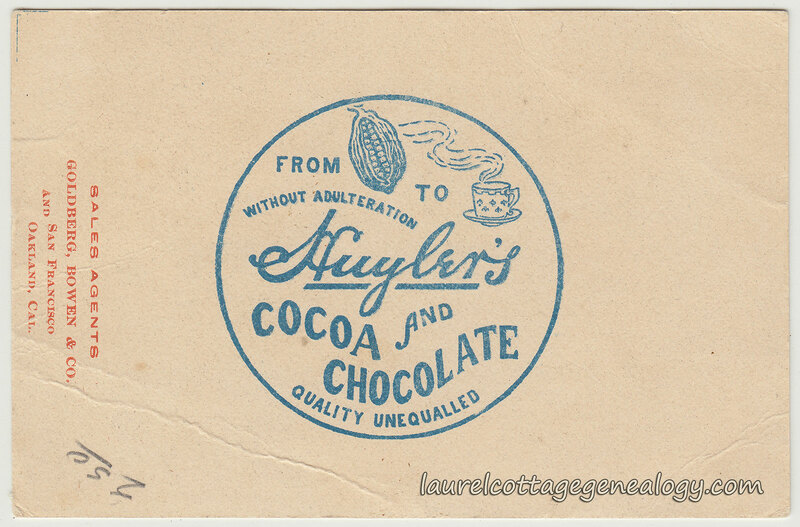 For the Huyler’s or the Goldberg, Bowen & Co. collector: At the time of this post, this appears to be the only Huyler’s card in this particular design, though the condition is poor due to the creases. 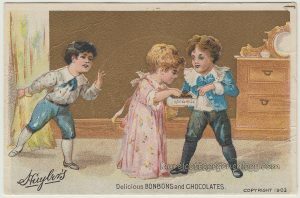 The little scene playing out up top shows two children who’ve found the chocolate stash at home, while the third, the lookout, is in the act of sounding the warning alarm. The Goldberg, Bowen & Co. stores were described by a San Francisco Chronicle writer in 1886 as, “paradise for the bon-vivant,” offering local grocery, household and other items as well as those imported from all over the world. The company’s origins come by way of The Bowen Bros. (who started out as fruit merchants) and grocery, wine and tea merchants, Lebenbaum & Goldberg. 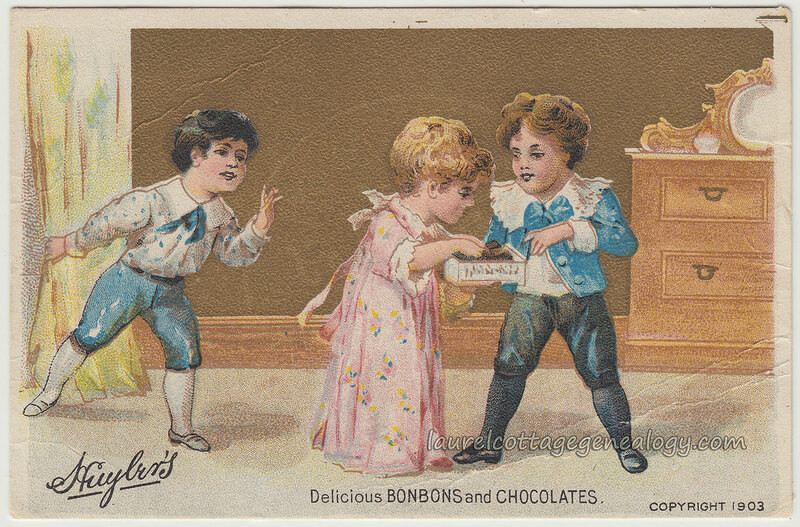 In 1881 Lebenbaum & Goldberg consolidated with The Bowen Bros. and became Lebenbaum, Goldberg & Bowen. In 1885 Bowen bought out Lebenbaum and the company became known as Goldberg, Bowen & Co. Newspaper ads can be found as late as 1925 for their 242 Sutter St., SF address. They prospered in Oakland, as well, having a couple of smaller stores in that city, but expanding to their 13th and Clay Street location around 1901. 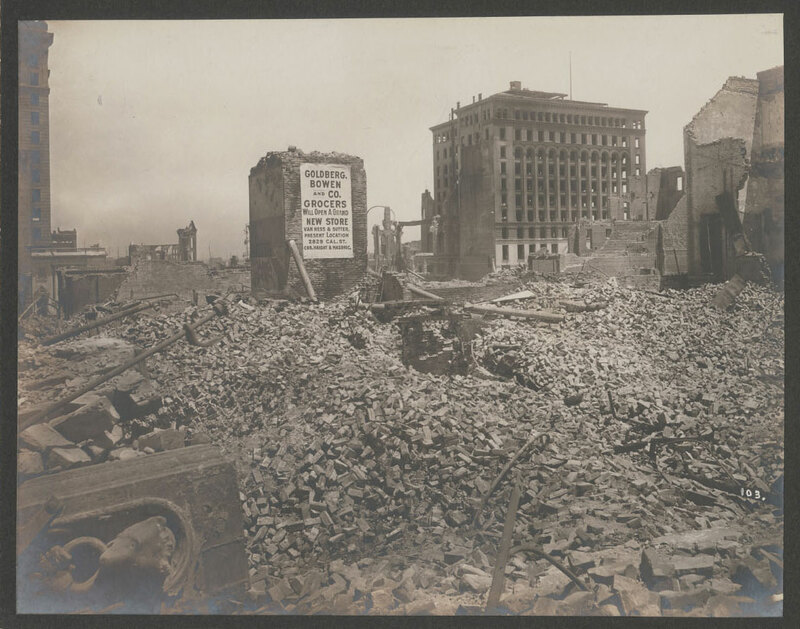 Below, posted here with permission from the California Historical Society, a compelling photo, taken after the 1906 San Francisco earthquake, of the site of GB&Co’s earlier Sutter St. store. Beyond the rubble, a large ad on one of the buildings still standing in the background reads: “Goldberg, Bowen and Co. Grocers Will Open a Grand New Store, Van Ness & Sutter. Present Location 2829 Cal. St., Cor. Haight & Masonic.” (One hundred and ten years later, this ad could easily mislead us: 2829 California Street and the corner of Haight and Masonic are two different locations.) The 1905 city directory shows all four SF locations as: 230-234 Sutter Street; 2829 California Street; the southwest corner of Haight and Masonic; and 426-432 Pine. In 1909 GB&Co. rebuilt the Sutter St. store at 242-254 Sutter (later just 242 Sutter) and thankfully, the building still stands today. Oh, but the poignant toppled stonework with the fox or wolf’s head, front left (!) The fox has a ring in his mouth, sort of reminding one of a large doorknocker. Wonder what building he had belonged to? Title: Site of Sutter St. store of Goldberg, Bowen & Co. [No. 103.] Creator/Contributor: Knight, George H. Date: 1906. Credit Line: Courtesy, California Historical Society. 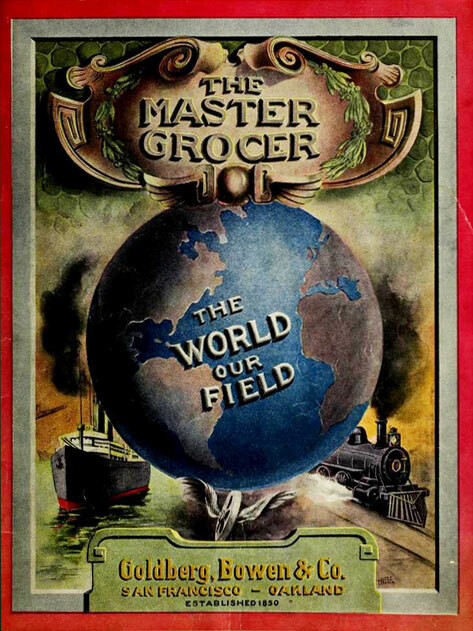 Below, one of the cover pages of Goldberg, Bowen & Company’s publication, The Master Grocer, which is a catalogue of goods, and includes recipes, poems and artwork. (Thanks to Jim Anderson HCD for the great find!) Earlier installments were offered monthly until at some point they became quarterly. This is the Winter 1915 edition. Click to browse! Other Sources: Huyler’s. n.d. https://en.wikipedia.org/wiki/Huyler’s. (accessed June 11, 2016). Goldberg, Bowen & Co.’s The Master Grocer, Vol. 45, no. 2. 1915. (https://archive.org/details/mastergrocer4521gold_0).